Hey guys!! Sorry for my absence.. I forgot the password for my account and had a heck of a time remembering it. I am trying to shorten one of my stays (main mast aft starboard backstay). The fittings are Norseman fittings, and I am looking for a Mechanical Wedge. The Norseman fittings are very similar to the Sta-Lok fittings. Has anyone done their own rigging before? Yes, 316 wire and stay-lok end fittings. Up the mast a lot but not that hard. Go up and remove a wire, go down and make a replacement. Go back up and install it. Repeat. Norseman is no longer is business I believe. Norseman is not longer made, but Sta-Lok is. The article is 2014 and pretty much how I replaced my rigging in 2006. Be sure to consider chain plates. All my standing rigging was done 3 years ago and the old chain plates had hair line crevice corrosion. I still have them as a reminder to replace before failure. By the way, what kind of wire do you guys have for your stays? It seems that I have 5/16 1x19 but I am not sure. Its all metric now. I'm not even sure you can find fractional rigging. Check that carefully if you are going to be reusing your Norsemans. You absolutely will need new collars to reuse. Oh and BTW, I have broken standing rigging 3 times. Only once was it from broken wire. The other 2 was from the fittings giving way. I would NOT reuse the fittings whatever Stayloc or Norseman say about reuse. I'm not a rigging expert, but I can give my 2 cents. I have purchased and received New Sta-Lok fittings (5/16" Sta-Lok for 1x19 5/16" wire), and I will attach them this weekend (hopefully). About to tune it all up! I think it is roughly 30% of breaking or working? does that sound about right? Dale on Maruska will know. Any one know the tension the rig should be? I have a Loose Gauge that fits the 5/16 rig.. The Pearson owners manual, section VI, is vague regarding setting up the stays. Basically it says that the forestay, backstay & uppers should be "taught". Lowers to be set up enough to eliminate mid-mast deflection under sail. If you are looking for specific tension numbers for the stays a good rigger can give you that. He'll have a gauge to do the setting up. Cheers! But I already have a loose gauge and the more I get to put my hands on the better my knowledge will be about the boat workings.. And hopefully a piece of mind.. But I have yet to find that one ha! The short simple answer is: 10% of the wires breaking strength. So... the industry standard strength for 316 SS, 5/16" diameter, 1x19 wire is around 10,600 pounds. This would mean you would tension it at 1,060 pounds. The real answer of course is... it depends on the condition of the rig, the boat, the conditions you are sailing in, how much power you want to harness, the mast bend under load and the sail shape you want to achieve. And where you start is the head stay. Does the boat have a furler? 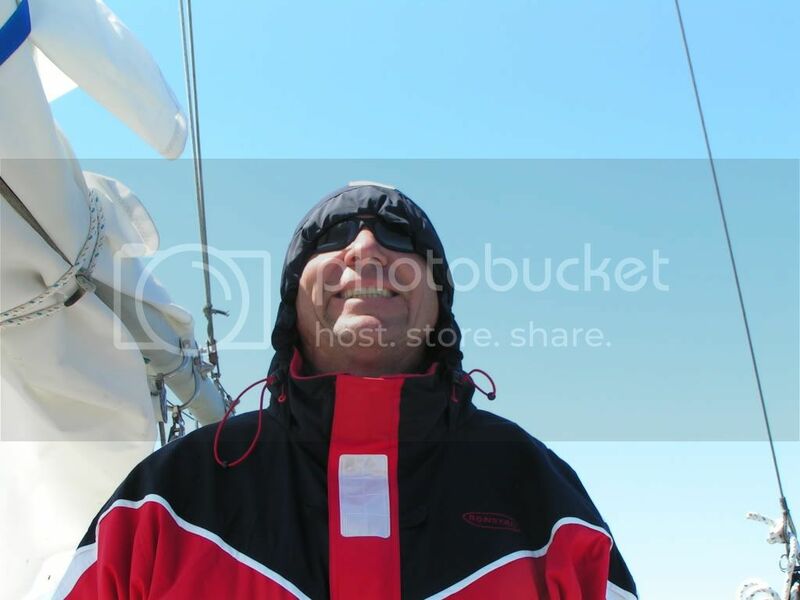 How much sag you have in the head stay if the boat is equipped with a furler will determine the ease or effort it takes to furl that head sail. Too much sag and it won't want to roll. Too tight of head stay and it will roll Ok but the boat may not want to point to weather to save its transom in many conditions. How do we measure head stay sag? The best way is to sight up the forestay while loaded and estimate how much the forestay is away from perfectly straight. This takes some experience to estimate properly but generally for a 365 it should be around 6" off of center in around 10 kts of air. When it is critical a line (spare halyard) can be stretched between the top of the mast to the stemhead fitting and a graduated ribbon flying in the middle can be used as a reference. Adjusting the headstay, for the most part, is a function of tightening or easing the backstay. Remember as you adjust the backstay the main mast will change rake (fore and aft angle) and that will affect how much weather helm you feel in the rudder. You may have to also adjust the headstay at the furler to maintain the proper balance of headstay/backstay and mast rake. If this all sounds complicated is sort of is because the next thing you have to do is sight the mast while loaded and adjust the uppers and lowers to obtain the desired mast bend side to side and for mid mast sag for your mainsail shape. All of this fine tuning typically creeps away from the 10% number, some lower and some higher. As a rule we will not exceed 12 to 15% breaking strength. We tune rigs for those that recognize the importance here in Buffalo for $125 for a single mast and a single set of spreaders. It takes a significant amount of time to do it right and much of it is while underway. Most owners are amazed the difference a few turns here and there can make to the balance and sailing ability of their boat.